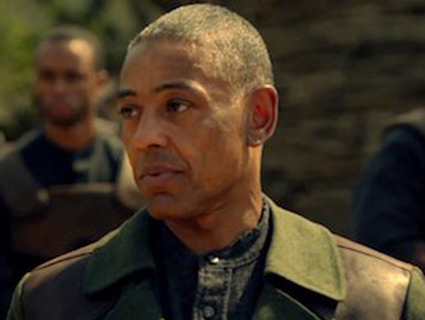 In the first ten minutes of NBC’s new sci-fi drama Revolution (premiering Monday, September 17 at 10 p.m. EDT), we meet the villain: Captain Tom Neville, played by Giancarlo Esposito. He is a 6-feet-tall, light-skinned, half-black militiaman of the Monroe Republic. He rides into town imposingly atop a large horse, accompanied by a pack of angry bodyguards brandishing rifles. Neville wears a trenchcoat, dark sunglasses, and a pistol at his hip—he calls to mind a slimmer Morpheus from the Matrix franchise. He is charismatic and composed, and speaks in a rich baritone. The village folk (dozens of good-looking white people) look on in trepidation. At first glance, you may feel inclined—as I was—to think, “say, that Captain Neville looks and sounds an awful lot like Barack Obama, now, doesn’t he?” only to have your nagging liberal guilt kick in, thus batting away such a mildly racist assumption. Phew! You’ve dodged a mildly racist bullet, so it seems! NBCBut then Neville starts talking to the white townsfolk about taxes—burdensome taxes—that are owed to the Monroe dictatorship. He reinforms them that for civilians “owning a firearm is a federal offense.” He threatens to “reeducate” their children if his demands aren’t met. And then, faster than you can say “Hussein,” Neville and his crew begin terrorizing and decimating the assembly of benevolent, over-regulated white folk! By now this should really be reminding you of someone—or at least the acute right-wing spin on the administration of a certain someone. And so it was that on September 17, 2012, NBC introduced the Obama-Morpheus Tyrant. Whether these, uh, parallels are intentional or not is unclear; cast and crew insist that the show draws inspiration from the American Revolution, not the tea party or Alex Jones. Whatever its intended take on modern American politics (that is, if it actually has one), the pilot episode of Revolution is a commendably decent hour of television that does just fine without the hassle of partisan overanalysis. I won’t get too deep into the weeds of the largely implausible premise. The “post-apocalyptic” action-thriller is the latest offering from TV mega-producer J. J. Abrams, from a script by Supernatural creator Eric Kripke. For some horrible reason, all the world’s electricity goes out. Governments crumble, warlords and competing militias take over. Every country on the planet becomes Somalia but without any air conditioning. Revolution focuses on a ragtag group led by ex-Marine Miles Matheson (Billy Burke) and his gutsy niece Charlotte (Tracy Spiridakos). Miles is good with swords, small arms, and at waxing Han Solo. Tracy (a knock-off The Hunger Games’ Katniss) kills things with her crossbow. They may or may not hold the key to rebooting the world’s power. So, the militia dudes hunt them. The last time NBC tried to pull off something this ambitious, this demanding of long-term viewing, we got The Event two years ago—and that went south at lightning speed. But at least for its inaugural hour, Revolution—ridiculous premise included—is staged better than it has any right to be, is better acted than it has any right to be, has sharper dialogue than it has any right to contain, and is far more engaging than what we’ve come to reasonably expect from NBC’s 10 p.m. time slot. The pilot was directed by the gifted Jon Favreau, who helmed the Iron Man movies. Thanks to his knack for kinetic energy and pacing, the melees and PG-13-grade bloodletting are choreographed and shot with just the right amount of discipline. Spiridakos is surprisingly adept and convincing as rebellious pseudo-Katniss, and Esposito nails the cold charm that defines Neville. Usual caveats: NBC has a well-practiced habit of tanking good ideas quickly. But for now, Revolution has a fighting chance. 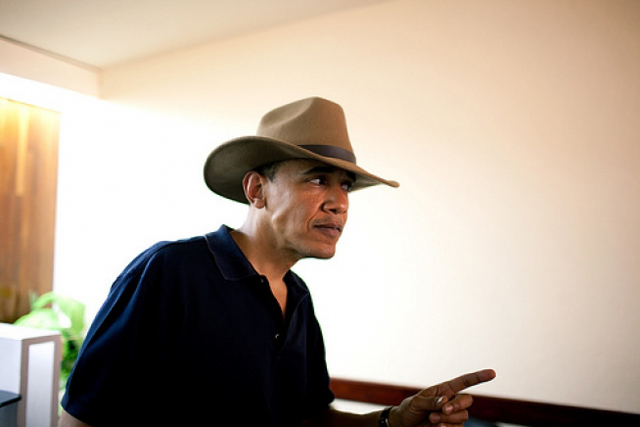 Come for the stunning chutzpah of the gleefully authoritarian Morpheus-Barack; stay for the intriguing goods.